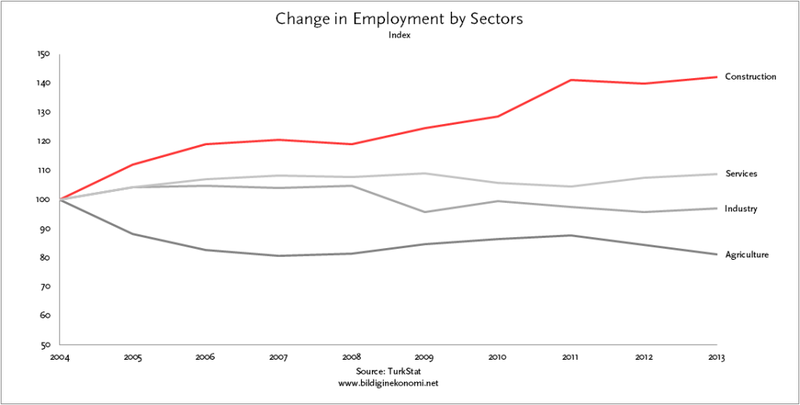 An important driver of Turkey’s recent economic growth is the growth in construction sector. While the ratio of the size of the construction sector to that of the GDP has remained rather stable around 5.5%, construction-related employment has increased not only faster than the other sectors in the economy but also the rest of the world. In Table 1, we combine three different variables: Referring to the right axis, the red line traces the trend of the ratio of the size of the construction sector to that of the GDP. In addition to this line, it is perhaps important to note that the real estate activities (not shown on the table) also constitute another 5% of the GDP. Together these two sectoral sub-categories constitute nearly 11% of the GDP. On the same table, referring to the left axis, the dark grey columns refer to the growth rate of the construction sector -which is highly sensitive to the changes in the overall economic growth rate of the economy (represented by the light grey columns). Notice that, in periods of economy growth, the growth rate of the construction sector tends to be larger than the growth rate of the overall economy. 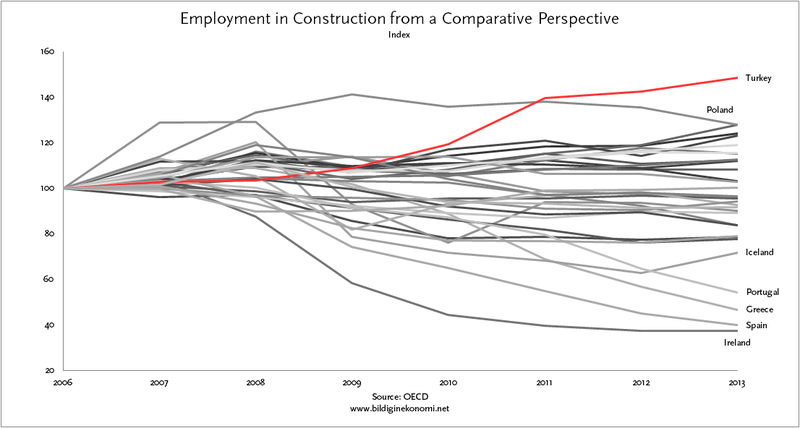 And during the crisis years (2001, 2008, 2009), contraction in construction is larger than the contraction in the overall economy. In Table 2, we trace the growth of employment in the construction sector from 2004 to 2013 in comparison to the other three sectors, agriculture, industry and services. While agriculture and industry declined, services and construction grew, respectively, 9% and 42% in ten years. In Table 3, using the OECD data from 2006 to 2013, we compare the growth of construction-related employment in Turkey with 33 other countries. Turkey represented with the red line (along with Poland just below it) stands out quite dramatically. In short, while the ratio of the size of construction sector to the GDP has remained stable yet sensitive to the changes in the economic growth, the employment in construction-related activities has increased at a quite rapid rate. An important implication of this is that those who are employed in the construction sector (usually the most precariously employed and low-paid workers) will be the first ones to be adversely effected and possibly laid-off during an economic downturn. Data on Table 1 is downloaded from the website of Turkish Statistical Institute, “Gross Domestic Product by Production Approach” link. Data on Table 2 is downloaded from the website of Turkish Statistical Institute, “Labour Force Statistics” link. Data on Table 3 is downloaded from the OECD website, “Short-Term Labour Market Statistics: Employment by industry” link.